What does ʻai pono mean? Why is it important to eat well? Are school lunches healthy? What is the healthiest food you eat? If you wanted to eat healthier, what kinds of things would you need to change? 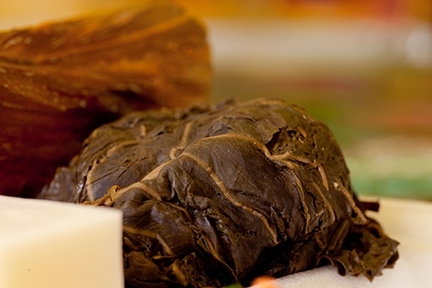 What are some differences between the food people ate in old Hawaiʻi and what we eat today? What do you think would happen if you decided to eat only healthy foods? Would this make things hard for your friends or family? Create a menu of healthy foods for you and your family. Share the menu with the person who does most of the shopping and cooking. Talk about how the menu might be used in your household. I ola nō ke kino i ka māʻona o ka ʻōpū. The body enjoys health when the stomach is well filled. Remember all that jump roping you did in PE? You can probably thank the brown rice and apples you ate earlier. Catching on to some tricky math concepts? Don’t forget to thank the poi and carrots you ate in the morning. Food gives us energy. It keeps our minds alert. Food comes from the land. As Hawaiians, we have great love for the land, and we take good care of the ‘āina. This practice is called mālama ʻāina. When we care for the land, it grows healthy food for us. The practice of eating healthy food is called ʻai pono, and it’s something we’ve been doing for generations. What kinds of foods did our ancestors eat? Long ago, our kūpuna (ancestors) farmed plants and animals. They grew many different foods. 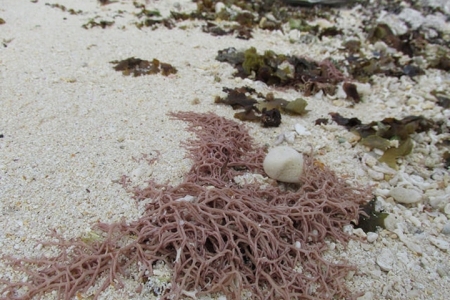 They fished and gathered limu (seaweed) from the ocean. They ate very little chicken and pork—these foods were reserved for the chiefs. Our kūpuna ate green, leafy vegetables every day. 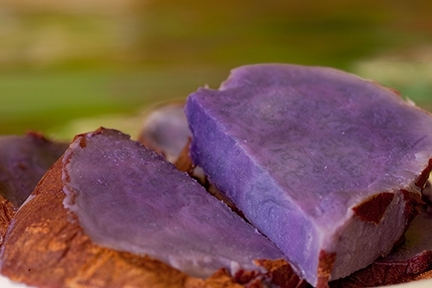 Kalo (taro) was the most important food plant. The corm is usually mashed and made into a paste called poi. Kalo is the eldest member of our ʻohana (family). We have great respect for it and take good care of it. ʻOhana today still grow and eat kalo. 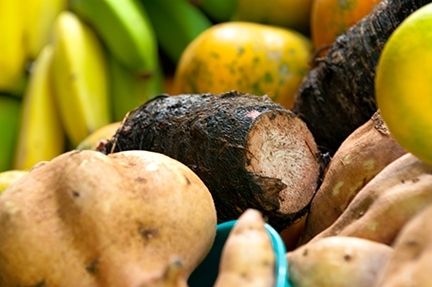 We also enjoy ʻuala (sweet potatoes), ʻulu (breadfruit), and uhi (yam). We also eat green vegetables like limu (seaweed), lūʻau (young taro leaves), and palula (young sweet potato leaves). We grow other vegetables too. These are not traditional foods. But they are just as healthy. Some examples are lettuce, bok choy, kale, and chard. These veggies have a lot of vitamins! Why do we grow healthy foods for our ʻohana? 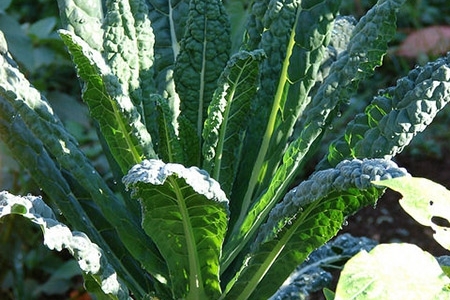 ʻOhana and communities are growing healthy foods. We practice healthy farming. Some of these farming practices are ancient. One kind of farming is called organic. Organic farmers do not use chemicals. Safe methods are used so that the land and the people who work on the land are not harmed. One method helps to provide water for plants. The farmer puts coconut husks around the plant. The husks collect water when it rains. 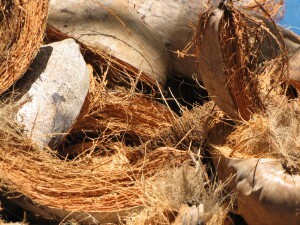 The fibers of the coconut husk act like a sponge, so the husk traps water in the fibers. The water is released slowly over time. This method does not cost money. The farmer does not have to install costly water systems. It’s an ancient method, and it’s smart. The farmer uses materials grown on the land. Another method helps to feed the plants. The special name for plant food is called fertilizer. An organic fertilizer we use in Hawaiʻi contains limu and fishmeal. Limu and fishmeal are mixed into the soil. This makes the soil nutrient rich. A nutrient-rich soil makes plants grow strong and healthy. By growing our own food, we’re putting our mana (spiritual power) back into the land and into the mouths of our ʻohana. This strengthens our bodies, minds, and spirits. What are some customs practiced at mealtime? We learn about food during mealtime. We watch our ʻohana eat. We watch what our ʻohana eats. We learn customs about food. We learn about portion control. How much should I eat? What amount of food will keep me healthy? We also learn about taking only what we can eat and not wasting. There are many Hawaiian akua, and they have multiple body forms. Some of their forms are the foods we eat. Eating these particular foods brings us closer to these akua. By eating these and other healthy foods, we are receiving nourishment to thrive. The chart below shows foods that are a kino (body form) of a Hawaiian akua. What can we do to eat healthier? Baby lūʻau and graduation parties are a time to celebrate. 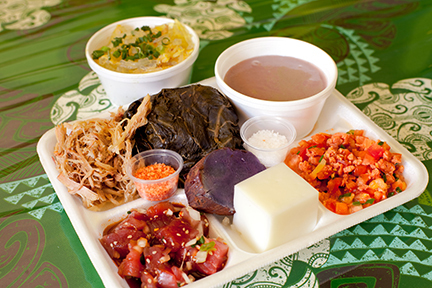 Many of these parties serve traditional foods our kūpuna ate. 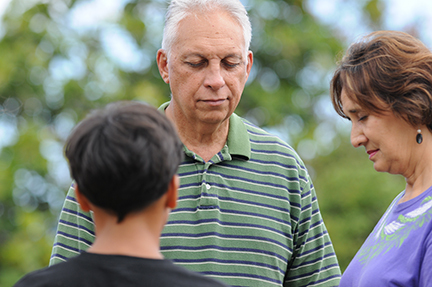 We can learn from our kūpuna. The foods they ate gave them energy to work the land and fish the ocean. We can practice these same customs. ʻAi pono. Let’s eat right. Let’s stay healthy—for our bodies, our minds, and our ʻohana. Try these simple, healthy recipes with your ʻohana! 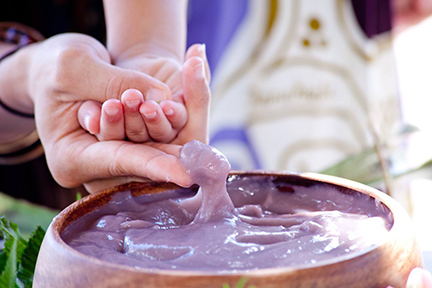 They come from Kamehameha Schools' “E Ola Pono: A Native Hawaiian Health Curriculum for Middle School Students.” There are no set measurements, so you may mix and choose ingredients as you desire. Recipe by Herbert Hoe and Kaʻiulani Odom. Mix together shoyu, water, vinegar, and a dash of patis until you have a sauce you like. Put in dried ʻōpae to soak. Rinse and clean the hōʻiʻo. Break off the hard ends and discard. Blanche the stalks in boiling water. Take out of pot and rinse with cool water. Cut into bite-sized pieces. Mix together hōʻiʻo, limu, and other vegetables. Pour the ʻōpae with all the sauce over the vegetables. Toss again. Steam or broil sweet potato for 10 to 15 minutes. Do not overcook. You should be able to pierce with a fork. Turn oven either to 400 degrees or broil. Brush a cookie sheet with a little coconut oil. Slice sweet potatoes in 1/4-inch rounds and lay on cookie sheet. Brush sweet potato rounds with a little coconut oil. Sprinkle sweet potato rounds liberally with plain cinnamon. Bake or broil till toasted on top. 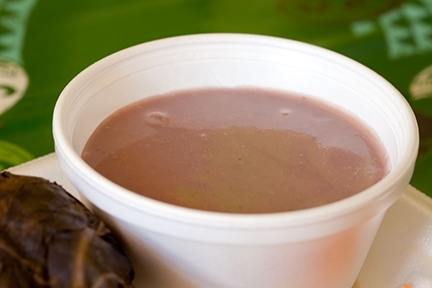 The following recipe by Kaʻiulani Odom and Herbert Hoe requires a blender. Put ingredients into a blender and blend. Pour into cups and serve.